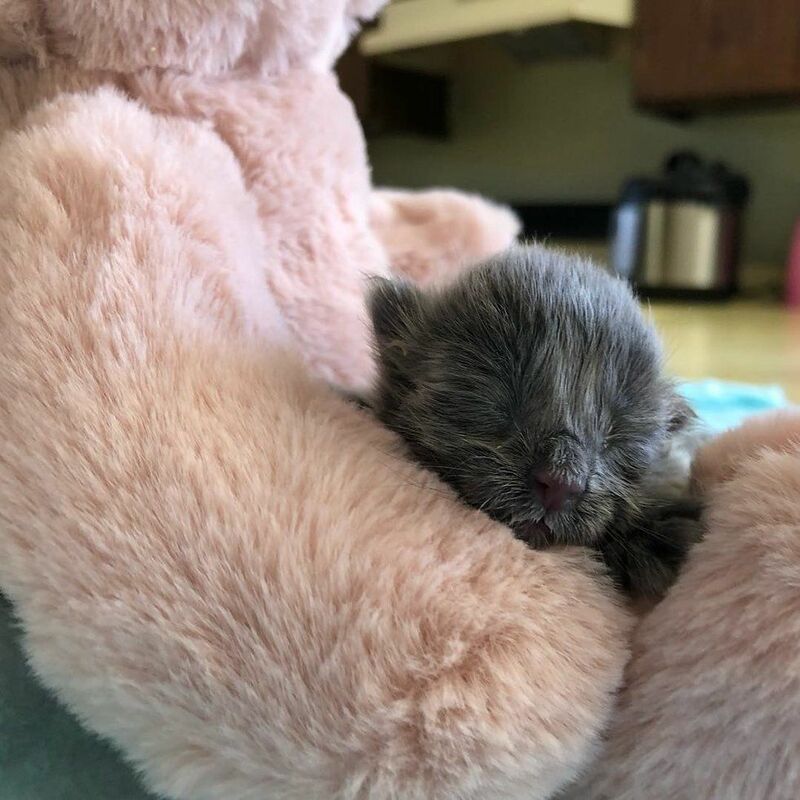 Smokey was found with 2 other siblings 1 dead and 1 on the way, the people who found Smokey and his sibling who was alive began to feed them through bottles as soon as they could, sadly his sibling did not make it. Smokey was sent to a foster home who took good care of him, throughout the night he gained 18 grams, "he started purring early. Like the first day we got him, he already had a ferocious purr. That's always a good sign to me" Shelbi Uyehara, who was the foster of Smokey said. During the foster care, the other brother Bandit did not make it, they tried so hard, after his death Smokey became an attention seeker, always needing love and attention, after every meal Smokey held onto his favourite bear. After some time it was very clear Smokey was feeling lonely without his brother Bandit, Nitro the resident cat, helped out by grooming and cleaning Smokey, a few days came by and Ana, Kristina, and Daniela were brought in, they all had dust on them and inside of them making it hard to breath and a dangerously high level of death for these kittens, after a few days they came back and began to get stronger. Smokey was still lonely, Shelbi decided to think about introducing Smokey to the three girls, she was hoping for the best. She decided to introduce them, Smokey saw the three girls and was determined to get some friends, he turned up his charm with his purrs, after sometime the three thought he was mum and rolled all over him, he accepted the big brother role, Shelbi was delighted to see Smokey and the three girls getting along and being happy, Smokey was happy not to be alone anymore. are you happy for smokey? tell us below in the comments!